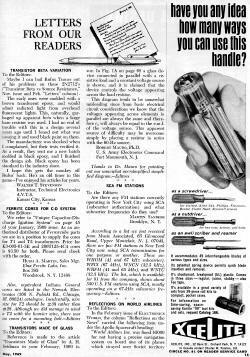 This letter to the editor column from a 1969 issue of Electronics World got my attention because of the submission by reader Walter T. Stevenson. He mentions having discovered that semiconductors, in his case a transistor, could have their junction conductance modulated by ambient light sources, in his case a fluorescent light. Evidently some of the early transistors were shipped on a substrate where the die was potted with a translucent epoxy compound that permitted some light penetration. At least one manufacturer switched to an opaque compound as a result of Mr. Stevenson's report. I remember the first I experienced the phenomenon was as a technician working at Westinghouse Oceanic Division in an engineering lab. I was doing a lot of prototype circuit fabrication mounting, wire bonding, and testing semiconductor die on bare substrates. While testing circuits I noticed that the readings would be different depending on whether my workbench light was on or off. The engineers had never seen that, either, since we were all new at it. The final items were packaged in light-tight enclosures and tested prior to delivery to the customer for evaluation, so we never shipped with bad data. BTW, does anyone else remember when owning one of the Xcelite "99" tool kits on the page was a status symbol? Maybe I can bail Rufus Turner out of his problems on those 2N2712's ("Transistor Beta vs Source Resistance," Nov. issue and Feb. "Letters" column). The early ones were molded with a brown translucent epoxy, and would admit radiated light from overhead fluorescent lights. This, naturally, garbaged up apparent beta when a large base resistor was used. I had no end of trouble with this in a design several years ago until I found out what was causing it and used black paint on them. The manufacturer was shocked when I complained, but their tests verified it. As a result, they sent me a new batch molded in black epoxy, and I finished the design job. Black epoxy has been standard in the industry since. I hope this gets the monkey off Rufus' back. He's an old timer in this game - I've enjoyed his articles for years. Walter T. Stevenson, Instructor, Technical Electronics A.V.T.S. 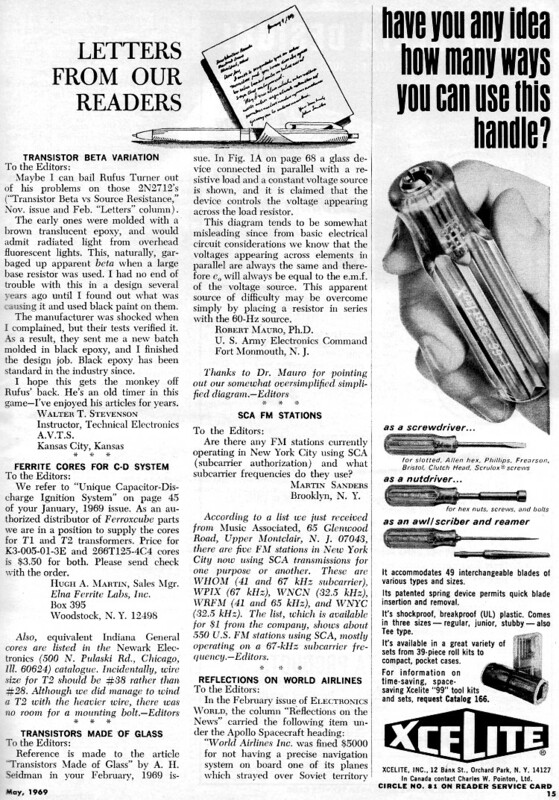 We refer to "Unique Capacitor-Discharge Ignition System" on page 45 of your January, 1969 issue. As an authorized distributor of Ferroxcube parts we are in a position to supply the cores for T1 and T2 transformers. Price for K3-005-01-3E and 266T125-4C4 cores is $3.50 for both. Please send check with the order. Hugh A. Martin, Sales Mgr. 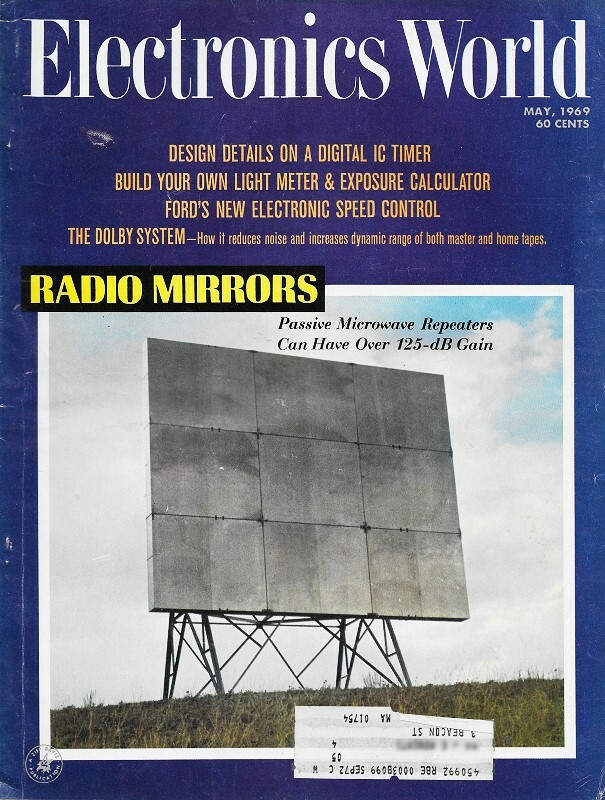 Reference is made to the article "Transistors Made of Glass" by A. H. Seidman in your February, 1969 issue. In Fig. 1A on page 68 a glass device connected in parallel with a resistive load and a constant voltage source is shown, and it is claimed that the device controls the voltage appearing across the load resistor. This diagram tends to be somewhat misleading since from basic electrical circuit considerations we know that the voltages appearing across elements in parallel are always the same and therefore eo will always be equal to the e.m.f. of the voltage source. This apparent source of difficulty may be overcome simply by placing a resistor in series with the 60-Hz source. u. S. Army Electronics Command Fort Monmouth, N. J. Are there any FM stations currently operating in New York City using SCA (subcarrier authorization) and what subcarrier frequencies do they use? According to a list we just received from Music Associated, 65 Glenwood Road, Upper Montclair, N. J. 07043, there are five FM stations in New York City now using SCA transmissions for one purpose or another. These are WHOM (41 and 67 kHz subcarrier), WPIX (67 kHz), WNCN (32.5 kHz), WRFM (41 and 65 kHz), and WNYC (32.5 kHz). The list, which i-8 available for $1 from the company, shows about 550 U.S. FM stations using SCA, mostly operating on a 67-kHz subcarrier frequency -Editors.